What happens when your father’s family has been in the country since the 1600’s? (It is traceable, I’m assured by my dad.) Really old stories. And really old furniture. One of my favorite pieces of furniture in my parent’s house is a desk from the late 1800s…so that’s what this post is about. If you are bored by someone’s family history (that isn’t your family), stop reading. Not a lover of antique furniture? Stop reading. Interested by people that invent stuff and really old tables? I like you, and you should continue. I come from a lineage full of engineers, inventors, patent attorneys and sailors. I lovingly call them tinkerers – they tinker with stuff to make it work. Example of this prowess? My grandpa, Captain (we sailed with him as children on Lake Michigan), had the caption, “I’ll fix that!” under his high school year book photo. As his engineering hobby progressed (and he learned that advertising just wouldn’t pay the bills, smart man) he became an inventor. Can you hear the pride? Yep, it’s boiling over in this post and I don’t care! Not a fan of poorly taken photos? You’re already this far, might as well finish up the post. 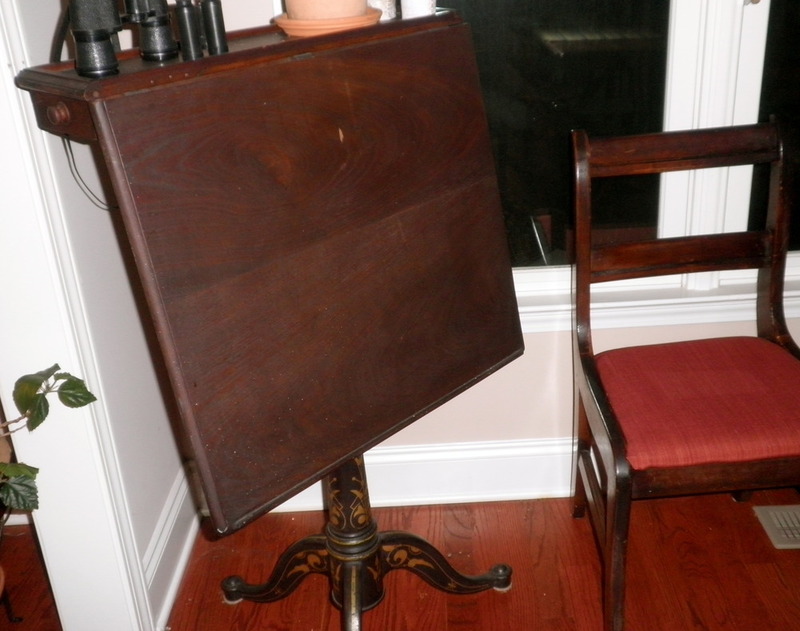 First off – this drafting table. It was created in Worcester, Mass. before the turn of the century and all of the mechanics of the table still work. It currently lives in my parents informal dining area behind the kitchen table. It’s purpose? To hold binoculars, look good and start interesting conversations. Inside one of the drawers (above), my great-, great-, grandfather signed it C.L. Newcomb 1890. Besides being an awesome table – absolutely beautiful in design and engineering, it has his lead-written signature in precise cursive. Doesn’t get much cooler than that. Or does it? Stay tuned for another table story later this week. Do you have any family pieces that make you proud of your heritage/lineage? I believe I have the same drafting table. It was given to my mother when she was a child living in Brooklyn. 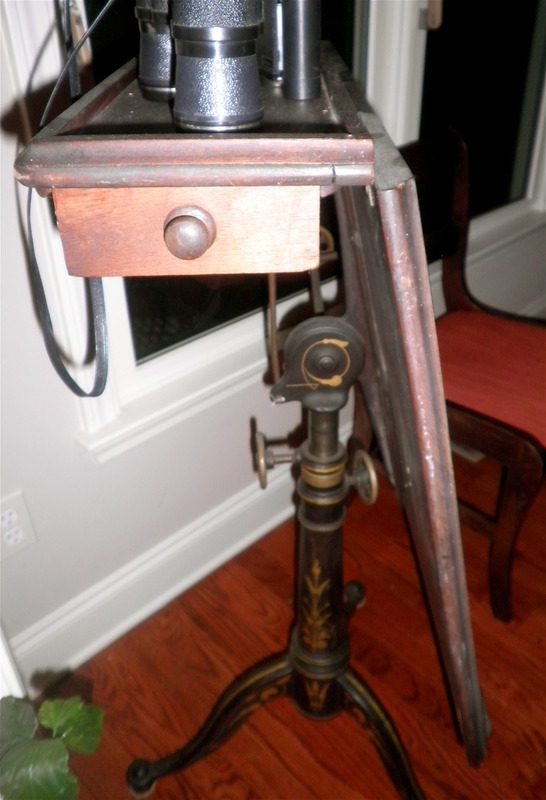 My father used to use it to do moonlighting when he was a drafter and I used it when I was taking drafting classes. Mine has the identical legs and feet but the drawers are missing. The mechanical components are the same but the paintwork on the iron is slightly different from yours.